Donald W. "Donny" Lowe, Jr. 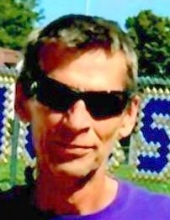 Celebrating the life of Donald W. "Donny" Lowe, Jr.
Obituary for Donald W. "Donny" Lowe, Jr.
Donald W. “Donny” Lowe, Jr., 54, of Davis, IL died at 11:25 a.m., Thursday, January 17, 2019 in Monroe Clinic Hospital. Born August 31, 1964 in Rockford, IL, the son of Mr. and Mrs. Donald and Lois (Dahlgren) Lowe, Sr. Graduated from Shirland Grade School, Durand High School, Class of 1983 and Kishwaukee Junior College in 1985. Donny was employed by Gorman and Company in Oregon, WI in the building maintenance department. Wendy K. (Bob) Lowe-Patterson and Peggy Clark; brother Robert “Bob” D. (Camille) Lowe; mother of the children Lynn Lowe; nieces and nephews Amanda Clark, Carin Lowe, Colleen Lowe, Becca Lowe, Daniel Lowe, Zak Lowe, Aly Lowe, Teddy Lowe and Brandi Patterson Leigard and several aunts, uncles and cousins. He was preceded in death by his brother Gary D. Lowe. Funeral ceremonies will be held at 10:30 a.m., Wednesday, January 23, 2019 in McCorkle Funeral Home-Durand Chapel, 101 W. Main Street, Durand, IL with Chaplain Linda O’Leary of Monroe Clinic Hospital officiating. Burial will be in Shirland Township Cemetery, Shirland, IL. A visitation will be held at the funeral home from 4:00 – 7:00 p.m., Tuesday, January 22, 2019. To send flowers or a remembrance gift to the family of Donald W. "Donny" Lowe, Jr., please visit our Tribute Store. "Email Address" would like to share the life celebration of Donald W. "Donny" Lowe, Jr.. Click on the "link" to go to share a favorite memory or leave a condolence message for the family.